If you follow urban gardening/agriculture issues, you may have heard about a disagreement that’s received quite a bit of attention. Folks are upset with the Dervaes family of Pasadena because they have trademarked the terms “Urban Homestead” and “Urban Homesteading”. This family has operated an impressive mini-farm in their yard for a number of years, and has a website that shares information on how to become self-sufficient by producing food around your home. They have recently sent letters to others who use the terms “Urban Homestead” and “Urban Homesteading” in blogs, on Facebook pages, and even book titles, asking them to remove these terms or provide attribution. This has not been well received, to say the least. The OC Weekly and the LA Times, among others, have covered this issue in detail. Rather than rehash the debate, I want to share what may be a little known fact; that Los Angeles was home to a movement which was a precursor to present-day interest in urban sustainability. The trend was called “Small Farm Homes”, or “Little Farms” and gained momentum in the 1920s, then continued full-force for several decades. As the population of Los Angeles County mushroomed, and real estate boomed in tandem with growth, subdivisions were developed with micro farming in mind. Many homes were constructed on lots of one half to three acres, and marketed as “small farm homes” to newcomers flocking to Los Angeles. Many were Midwestern farmers who no longer wanted large farms and cold weather, but didn’t quite want to give up their agricultural heritage. Others drawn to these new homes were city people, attracted by publicity campaigns touting Southern California’s abundant harvests and golden sunshine and hoping to try their hand at small-scale farming. The automobile helped to promote the popularity of small farms on the periphery of the city, as newly mobile Angelenos could now easily transport their harvest to local markets. The Los Angeles Chamber of Commerce did much to promote this “little farm development” around Los Angeles County. According to the Chamber, it was possible to make a living on a small farm on the outskirts of the city. People might make a go of it farming, according to the Chamber, with vegetables, fruit trees, and at least 200 laying hens on two to five acres. These small family-run, home-based farms helped to feed the demand of the growing city. The number of farms of less than 3 acres in Los Angeles County increased substantially during the 1920s, with 1,334 recorded in the 1920 census, and 5,000 in the 1930 census (White, 1933). Small farm homes contributed significantly to Los Angeles County’s status as the number one agricultural county in the US during this era. They also helped to make Los Angeles food-secure. According to a 1940 Los Angeles Chamber of Commerce brochure, “nearly half of the Los Angeles food supply originates on farms within 50 miles of the city”. The small farm home trend continued through the Depression and well into the 1950s. 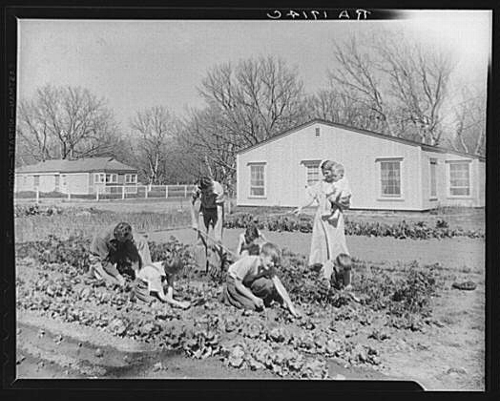 In 1949, the University of California reported there were approximately 10,000 families living on small farms of one acre in size or smaller in Los Angeles County. There are certainly differences between yesterday’s small farm homes, and today’s urban homesteads (TM). Today’s urban and suburban lots are much smaller. The Dervaes family’s Pasadena home is on a 1/5 acre lot, and certainly, many urban dwellers have much less space. The harvest from an urban yard today is more likely to supplement a family’s diet and income, rather than constitute a main component. Still, the motivators for self-sufficiency today and eighty years ago are similar; good food, a little relief for the family budget, and a sense of pride in “growing your own.” Whether you call it an "urban homestead (TM)", or a "small farm home", or maybe just "planting a garden", it’s a Los Angeles tradition that is once again gaining momentum. Scarborough, O. (1930, Jan. 5, 1930). What acre offers. Los Angeles Times. What the newcomer should know about agriculture in Los Angeles County and Southern California (1940). In L. A. C. C. o. Commerce (Ed.) (pp. 51). Los Angeles: Los Angeles County Board of Supervisors. White, R. P. (1933, Jan. 3). The new city of country homes. Los Angeles Times.